It might only be May but the ice cream man has been driving down my street for well over a month now. Every time I hear his musical truck all I can think about are drumsticks, ice cream sandwiches and popsicles. It reminds me that the warm weather is here to stay and it’s time to start stocking my freezer full of cool summer treats! 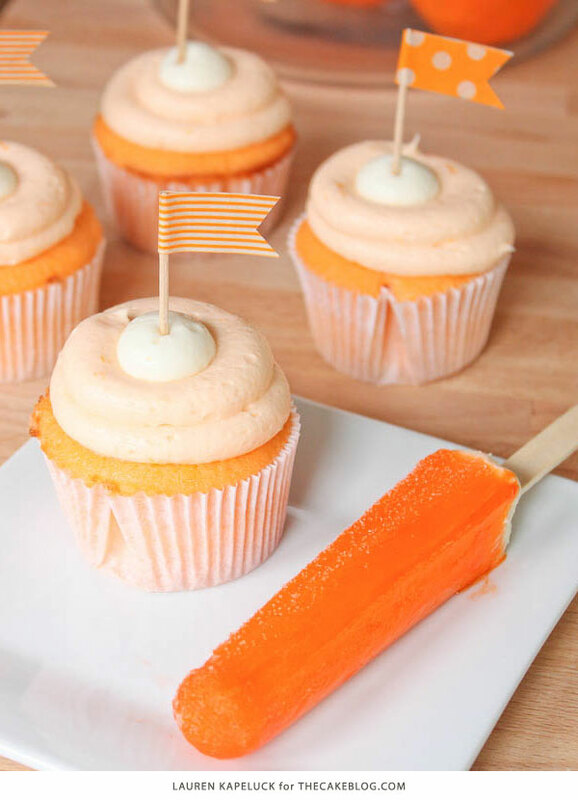 So thank you Mr. Ice Cream Man for inspiring me to create these Creamsicle Cupcakes based off of one of my all time favorite popsicle treats. I took a shortcut with this recipe and used a vanilla box mix as the base, but don’t worry it is packed full of all kinds of orange citrus goodness that you won’t be able to tell once you take a bite. Orange juice and orange zest are used in both the cake and cream cheese icing which really creates a lovely refreshing citrus taste. These cupcakes are really moist and super light, so don’t be surprised if you find yourself eating more than one at a time. To decorate I wanted to mimic the traditional Creamsicle popsicle so I used an apple corer to remove the center of the cupcake and added a white cream cheese filling. Orange cream cheese frosting was swirled on top and then one more dollop of white cream cheese icing was added to the center. These cupcakes would be perfect for a summer pool party or a citrus theme birthday bash. Add a scoop of vanilla ice cream along side and you’ve got one yummy treat! In the bowl of a stand mixer, combine dry cake mix and dry orange gelatin. Measure out the water, using the amount shown on the cake mix box. Do NOT pour it into the mixing bowl yet! First, remove 1/4 cup of the water and replace it with 1/4 cup orange juice. Now pour it into the mixing bowl. Add in eggs and oil, using the exact amounts shown on the cake mix box. Add in orange extract and orange zest. Beat on medium speed for 2 minutes until well combined. Scrape sides of bowl as necessary. Once cupcakes are completely cool, hollow out the center using an apple corer. In bowl of stand mixer fitted with the paddle attachment, beat butter and cream cheese until smooth and creamy. Gradually add in confectioner’s sugar 1 cup at a time and beat well, scraping down sides of bowl. Add extracts and mix well for about 2 minutes. Remove 1 cup of icing and set aside. This will be used as white cream center inside the cupcakes. Add orange zest to the remaining icing. Add orange food coloring, one drop at a time, until you reach the desired shade of orange. Spoon white frosting into a piping bag fitted with a large round tip. 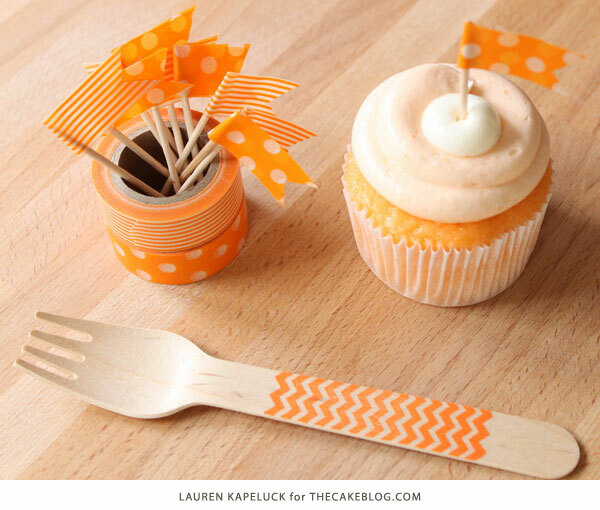 Spoon orange frosting into a seperate piping bag fitted with a large round tip. Fill center of each cupcake with white frosting. Use orange frosting and swirl around the center of the cupcake two times. Fill the inside of the swirl with a dollop of white frosting. Cut a two inch piece of tape. Wrap tape around a toothpick and align ends of tape together. Press to seal with toothpick inside. Make a V cut on the end to create flag points. Insert into cupcakes. What is the recipe for the filling inside? Is it the icing recipe minus the orange? Yes, the recipe for the filling inside the cupcake is the cream cheese frosting recipe, just without the orange zest and food coloring. I reserved about a cup before I tinted the frosting to save for the filling. Thanks for sharing, love it !!! Will definetly try this. Please, can you tell me if the substitution of 1/4 cup of orange juice is to replace the total amount of water, or if it is a partial amount along with the remaining amount of water? Thanks so much. I can’t wait to make these! The orange juice substitution is only to replace 1/4 cup of the water with orange juice, you still need to use the remaining amount of water that the box calls for. The box mix I used called for 1 1/4 cups water so I used 1/4 cup orange juice and 1 cup of water. I absolutely love creamsicles, Lauren, so this has got to be a winner! I’ve already pinned it on my Creamsicles & Orangesicles Board. Those look and sound delicious!! Yum!! 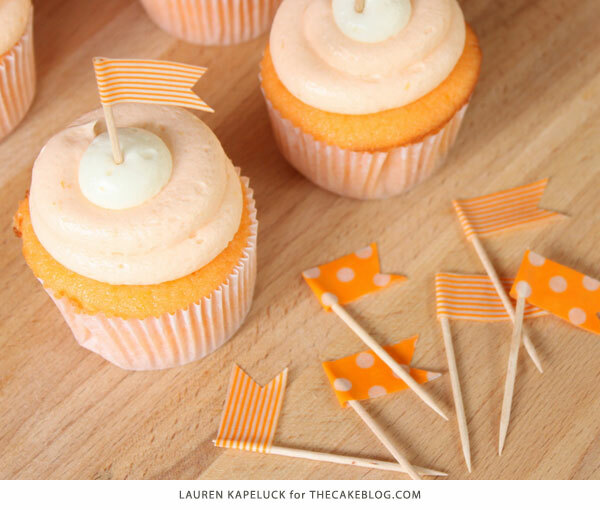 These sound so yummy and would perfectly match the colors for my son’s 1st bday party! Where did you find that adorable tape for the flags?? You can find cute washi tape at your favorite craft store. If you’re an online shopper, there’s a link in the supply list above. Hope that helps! Is orange gelatin the same as orange jello? The cupcakes are really good! Do they have to be refrigerated? Yes, they are best kept in the refrigerator due to the cream cheese icing. Best enjoyed at room temperature. Can these cupcakes be made in advance then iced on the day of? These look amazing. I didnt see though where you used the orange gelatin in the recipe? Lauren adds the orange gelatin at step #2 for the cupcakes. Happy Baking! I will definitely have to try these out. 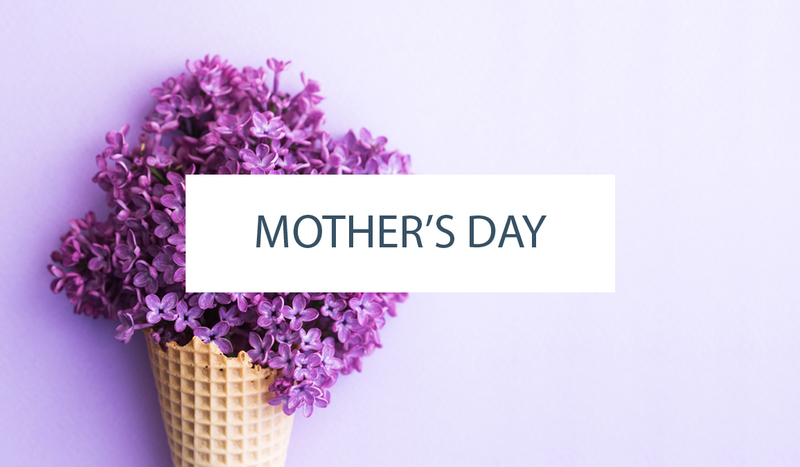 Thank you so much for your excellent recipes! I made these for my great-granddaughter’s 2nd Birth!day party, & people are still raving about them! They were some of the best I’ve ever tasted! Will be making these again! Reading the responses to these cupcakes and I am glad to hear they are getting favorable comments, my daughter’s birthday is coming up and wanted to try to make something different for the kids, so I will be trying these out as part of the sweets table. I made these for my little boy’s first birthday party. They are amazing! I will be making them again. Thanks for sharing! Your ingredients include 3 oz box orange gelatin, is that just the powder? Just add the dry orange gelatin powder to the dry cake mix in step 2. Happy Baking! I suppose you could throw the box in too … but why ..?? After digging out from under a total of about 2 ft of snow (with more on the way) we could all use some summer and since that is months away, I will be making these to at least bring part of the daydream to life! Thank you for sharing!!! How can I print this without using 20 sheets of paper? We’re working on a better print option for you! In the meantime, please use your browser to print. Then select only the pages with the recipe (pages 5,6). HOW do I print this recipe WHERE is the print it button! I love orange cream anything! Do I add the orange gelatin with the cake batter mix? I want to try these !!! Use a whole five cups of sugar for the frosting? Yes, five cups of confectioner’s sugar. AKA powdered sugar. These look delicious! I am thinking this would make a great bundt-type cake instead of cupcakes. 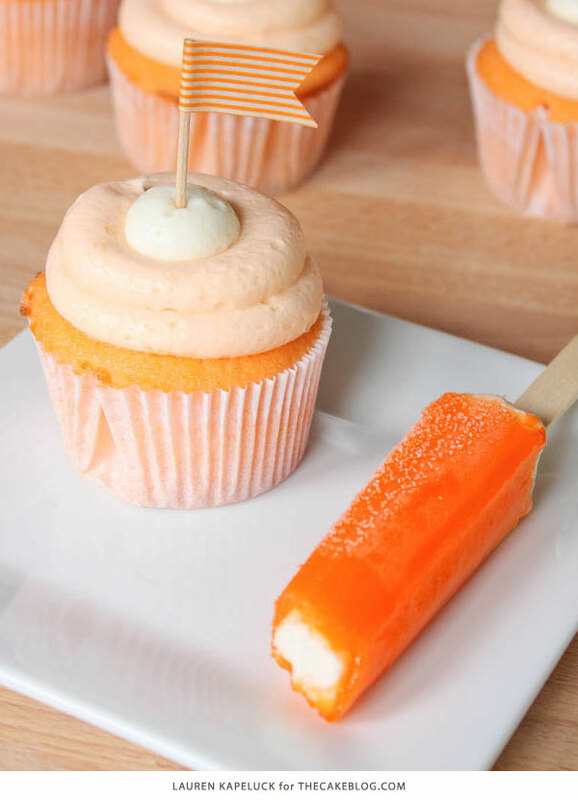 I would just omit the filling piece and ice the cake with the orange, cream-cheese frosting. Would that work? Thanks! We have not tested this recipe as a bundt cake, but it sounds delicious. You need to reword the water part. Now I have 24 crappy cupcakes. Omg you’re so rude. Sorry, but I read the other comments until I got to yours. She stated in a previous comment about the water/oj. Take the time to read before making a comment 🙂 would have saved you the trouble and 24 “crappy” cupcakes. Do you think i a whipped cream frosting would be good with these instead of the creme cheese? I dont mind cream cheese frosting but would prefer another option if possoble. Sure, you could certainly swap the cream cheese frosting for a traditional buttercream frosting or stabilized whipped cream. I made these tonight for a bake sale, and they are delicious! I love anything orange, and these are perfect. I don’t have an apple corer so tried to just cut out a piece with a small knife. When it didn’t work well on the first two, I didn’t want to mess any more cupcakes up, so I just piped the orange frosting on then piped a quarter-sized circle over the center. To decorate them, I cut candy orange slices in half (the whole ones were overpowering in size) and placed them just off center of the white frosting. They look great! Way to improvise Sharon! Love the addition of the candy orange slices! Oh how I wish we could attach a picture. Made these this weekend for my mom’s birthday. They turned out fabulous!! I had to divide my time, so made the cupcakes on Saturday and did the icing on Sunday. They turned out fabulous!! And they taste exactly like a creamsicle! The cupcakes turned out perfect, and since I didn’t have an apple corer, I used my Bismark icing tip, the usual round one for the main frosting and then for a touch of pizazz I used a large flower tip for the top white piece. Cannot wait to see what mom thinks! And did I mention then turned out fabulous?!?!? Thanks for the feedback Rhonda! 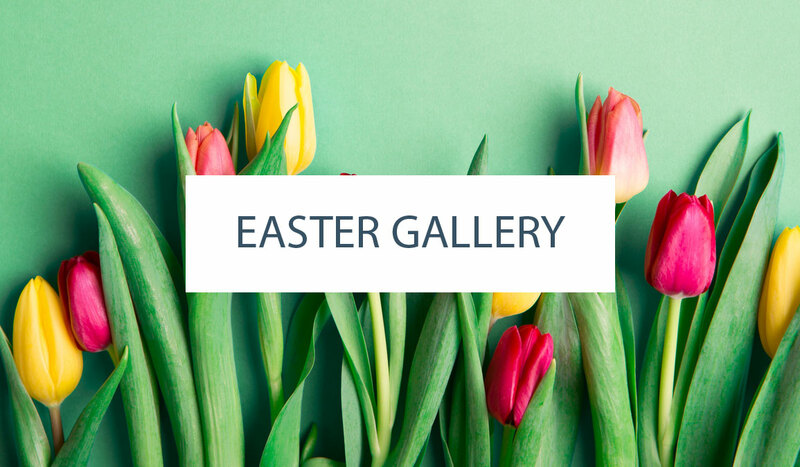 We’d love to see a photo of your cupcakes – post it on Instagram and tag @thecakeblog!